DEBALTSEVE, Ukraine -- It's the 'selfie' that, according to VICE news, proves beyond argument that Russia sent soldiers to fight in Ukraine. 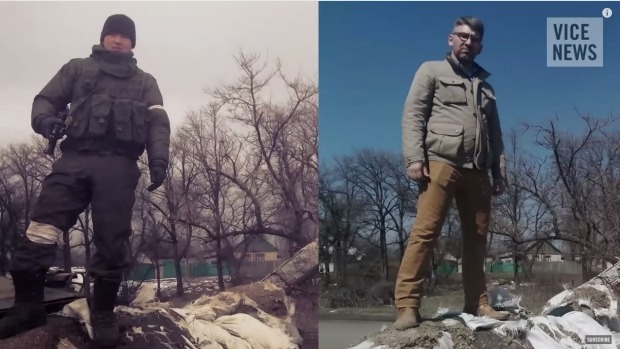 Telling 'selfies' ... right: VICE reporter Simon Ostrovsky stands in Vuhlehirsk in Ukraine, 13km west of Debaltseve. Left: Bato Dambaev, the man Ostrovsky says is a serving Russian soldier, stands at the same destroyed Ukrainian checkpoint in February. 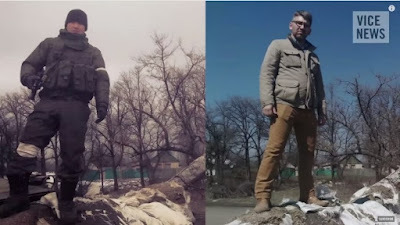 VICE's reporter Simon Ostrovsky has stood in the same spot and mimicked the pose of a man who, he says, was a serving Russian soldier standing on the rubble of a destroyed Ukrainian checkpoint. The video report builds on previous research from open-source project Bellingcat, by the Atlantic Council and by other media outlets. Bellingcat's Elliot Higgins provided evidence from social media of Russian military presence in eastern Ukraine. Ostrovsky took the evidence and researched one soldier, Bato Dambaev, an ethnic Buryat from Siberia, whose unit on the Mongolian border – Ostrovsky claims - was sent to fight in the key battle for Debaltseve earlier this year, which ended in defeat for Ukraine's army. Dambaev was very active on social networks including VK.com, Ostrovsky said. Photos from his account included selfies in Russian army uniform and at his base, one as recently as January 2015. Ostrovsky said the soldier left a trail of "digital breadcrumbs" on his way to Ukraine. One photo was taken in Taganrog in Russia, 64 kilometres from the Ukraine border. "We know from photographs that he spent quite a bit of time here last winter," Ostrovsky said. The photo was in a jacket with a Russian flag on the shoulder, a "pretty good indication (he) is an active member of the Russian army". Another photo of Dambaev, though not obviously identifiable as in a military context, was geotagged to the location of a big encampment of Russian soldiers in a field near the Ukraine border. Ostrovsky visited the area and saw three such camps. Russia has not denied the existence of these camps, saying they are for military drills. In one, key photo, taken in February and published on Dambaev's VK.com profile, Dambaev was wearing a military uniform – without insignia - carrying an automatic weapon and in what appears to be a battlefield. He was wearing a white armband, which locals in eastern Ukraine told Ostrovsky was the way separatist fighters identified themselves. The locals made a distinction between the separatists and the "Russian soldiers who they said were much better behaved", Ostrovsky reported. Ostrovsky found the precise location where the photo was taken, in Vuhlehirsk in Ukraine, 13km west of Debaltseve. "This is the exact spot where an ethnic Asian solider had his photo taken in mid-February," he said. "He then put that photograph up on a Russian social networking site and that's why we know that he's a serving officer in the Russian army because older posts on his profile page show him photographed back home in Russia at his military base." Dambaev's VK.com profile page listed his military unit and put his years of service as 2012-2016. Ostrovsky visited Dambaev's home city in Siberia. Asked by VICE how he had ended up in Ukraine, Dambaev said, "I don't know … maybe you are mistaken". "It's not me (in the photo) … I didn't post them to VK. You are mistaken." He denied leaving Russia. Russia has not denied that some of its citizens are fighting in Ukraine – but says they volunteered and went there of their own accord. "They [Russian volunteers] are among us, people of Donbass [Region, eastern Ukraine] because we are blood brothers," said the Chairman of the Council of Ministers of the Donetsk People's Republic, Aleksandr Zakharchenko, RT.com reported. "There is no secret that among the volunteers from Russia there are many military men. They are fighting together with us because they understand that it's their duty." The BBC has interviewed several soldiers who appeared to be genuine volunteers, including "retired professional soldiers hardened by Russia's wars against the Chechen rebels, some former policemen - and possibly, secret service agents - who later went into business, [and] some youngsters who've never even served in the army." "We have seen uniformed men wearing insignia of the Russian federation, but to draw the conclusion they are servicemen from another country is not for me to conclude."